England will always look back on this edition of the World Twenty20 and wonder what might have been had they had their best team available. The reasons for Kevin Pietersen not being part of the squad in Sri Lanka are well known, but what is less clear is the impact he would have made on England's defence of the trophy they won in 2010. We can say with some certainty that Pietersen is a fine batsman and an experienced performer in T20 cricket, but, to the frustration of all concerned, we will never know if he could have rescued England's campaign. With some of England's batting displays, it's possible that even Pietersen at his best may not have been able to take them to the semi-finals and beyond. Too often the batsmen failed, with the latest and final disappointment coming in the defeat by Sri Lanka as Lasith Malinga tore through the top order with three wickets in an over. 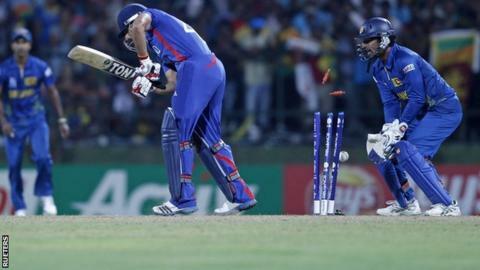 It was another example of England simply not getting a start that could win any form of cricket, let alone T20 and, from 18-3, there was no way back. England came here with a young, inexperienced side and it hasn't all been catastrophic. Samit Patel played really well in a losing cause against Sri Lanka, showing lots of character and no little flair, while Luke Wright produced a couple of excellent innings earlier in the tournament. However, for Stuart Broad's side to make three changes for such an important game against the hosts, one of which was to bring in a player with so little form, rather smacked of desperation. Ravi Bopara was dropped before the summer ended because of poor form, was left out of the squad to tour India and then found himself wandering around Sri Lanka with little to do. "Patel played the spinners so well he's got to be earmarked for a high batting position in the one-dayers in India. It was a brave effort considering he's had so little batting on this tour." All of a sudden he was pushed into a crucial game with no cricket behind him, which was clearly a risk, and it will be debated as to whether or not that was the right thing to do. With Craig Kieswetter being dropped altogether rather than merely slid down the order, it underlined the fact that England were searching for a winning formula that, ultimately, they were not able to find. Despite that, I could see nothing wrong with Broad's captaincy. He bowled bowlers at the right time and did not set bad fields. I do, however, think England, more so than the other teams, telegraph where bowlers are likely to bowl the ball by the fields they implement. The field placings can sometimes be a little obvious and are often changed in the middle of an over to provide the batsman with an educated guess of where the ball is going to be. Maybe that shows a little naivety on England's part. Hopefully, England would have learned some things from this tournament, not least because they came across some players that play a lot of Twenty20 cricket. Sri Lanka look a decent bet to win it, but there are some good teams who will battle out the semi-finals. Yes, the tournament has taken a little while to heat up, but in the Super Eights the standard has been pretty high.